It is when fighting breaks out that health-care services are most needed, but it is also then that they are most vulnerable to attack. Doctors and nurses, ambulance drivers and paramedics, hospitals and health centres and even the wounded and the sick have all come under attack. This violence can disrupt the health-care system when people need it the most. Combatants and civilians die only because they are prevented from receiving medical attention in time. Entire communities are cut off from vital services, such as maternity care, child care and vaccinations. Sometimes the disruption can be so severe that the entire system collapses. 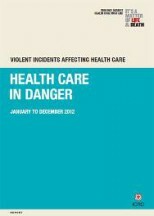 Violence against health-care workers, facilities and vehicles, therefore, is a humanitarian issue with widespread and long-term effects. We need to address it together. Health Care in Danger: The Human Cost. Through the voices of doctors, nurses, ambulance drivers and patients, this film shows the human cost of violence against health-care workers and facilities. The ICRC, through research and work in the field, has identified a number of issues requiring particular attention, such as the vulnerability of health-care facilities to attacks and looting, the number of attacks on local health-care providers (which accounts for over 90% of incidents recorded by the ICRC) and the frequent violation of ethical principles of medical staff, in particular medical confidentiality and non-discrimination between patients. Understanding violence against health care is crucial. It involves looking at the different forms that this can take, and who the targets and who the perpetrators are. Only then can effective measures be put in place to ensure that wounded and sick people have access to health care and that the facilities and personnel to treat them are available, adequately supplied with medicines and equipment and are safe. Violence against health care facilities. What is it? Violence includes bombing, shelling,looting, forced entry, shooting into, encircling or other forceful interference with the running of health-care facilities (such as depriving them of electricity and water). Health-care facilities include hospitals, laboratories, clinics, first-aid posts, blood transfusion centres, and the medical and pharmaceutical stores of these facilities. Violence against the wounded and the sick. What is it? 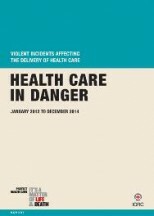 Violence includes killing, injuring, harassing and intimidating patients or those trying to access health care; blocking and interfering with timely access to care; the deliberate failure to provide or denial of assistance; discrimination in access to, and quality of, care; and interruption of medical care. The wounded and the sick include all persons whether military or civilian who are in need of medical assistance and who refrain from any act of hostility. This includes maternity cases, newborn babies and the infirm. Violence against health care personnel. What is it? Violence includes killing, injuring, kidnapping, harassment, threats, intimidation, and robbery; and arresting people for performing their medical duties. Health-care personnel include doctors, nurses, paramedical staff including first-aiders, and support staff assigned to medical functions; the administrative staff of health-care facilities and ambulance personnel. Violence against medical vehicles. What is it? 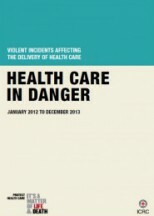 Violence includes attacks upon, theft of and interference with medical vehicles. Medical vehicles include ambulances, medical ships or aircraft, whether civilian or military; and vehicles transporting medical supplies or equipment. Available in PDF and in hard copy.